The 41st Annual Mahoning Valley St. Patrick's Day Parade will be held on Sunday, March 10th, 2019. The Parade will step off at 1:00 PM and proceed north on Market Street from McClurg Road to Southwoods Avenue. Boardman has proven to be an excellent venue for the Valley’s Biggest Parade. 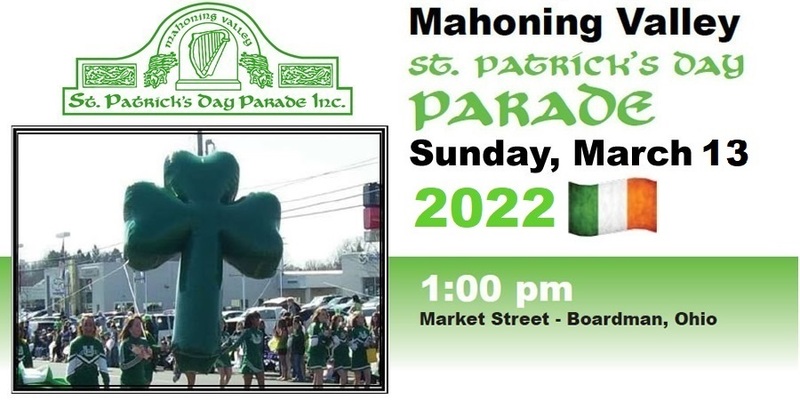 Sponsors of the Parade this year will again be the Mahoning Valley Irish Organizations, WFMJ TV-21, and The Vindicator. We are inviting you to join the Parade and 25,000 to 30,000 of the Valley’s finest spectators to celebrate this family tradition. The theme of the Parade this year is “Celebrating Irish Music”. Trophies will be awarded. The Grand Marshal for this year’s parade is Maureen Collins, the Ockerman Award recipient is Buzz Kelty, our Lord Mayor of Kilkenny is Lenny Fisher. The Edward J. Reese Family Reviewing Stand will be near the North end of the march and located in front of Johnny's Restaurant. Master of Ceremonies at the Reviewing Stand is Casey Malone. The Shaffer Brothers will perform at the Post Parade Party at The Operating Engineers Hall on McClurg Road. Like any public extravaganza, the budget grows each year and now exceeds $15,000 annually. Bands, parade specialties, printing, promotion and other costs make it necessary to ask for your help. The Parade is made up of twelve divisions, with each division sponsored by various local businesses. 1. A Banner with your company's name to lead your division. 2. A trophy named in your honor. 3. A place in your division for your company to participate in the Parade. 4. An invitation to the Pre-Parade Breakfast. 5. Your own place on the reviewing stand. 7. A full page ad in the Parade Program (10.000 copies), free to spectators along the Parade route. Camera ready copy appreciated. Your Division Sponsorship brings you more than just civic pride, it brings you the recognition you so greatly deserve as a community leader for all you do for others. Division sponsorship is $1,000.00 made payable to the Mahoning Valley St. Patrick's Day Parade Committee, Robb Kale, Treasurer, P.O. Box 3555 Boardman, OH 44513. For further information about your sponsorship please contact Eileen at 330-501-1165 or Joyce at 330-402-5275. As we approach our 41st Anniversary, the Parade Committee again thanks you for your support in the past and look forward to your support in 2019.